It’s so hard to grab and keep the attention of 11 to 14 year olds today, not to mention that of their parents. 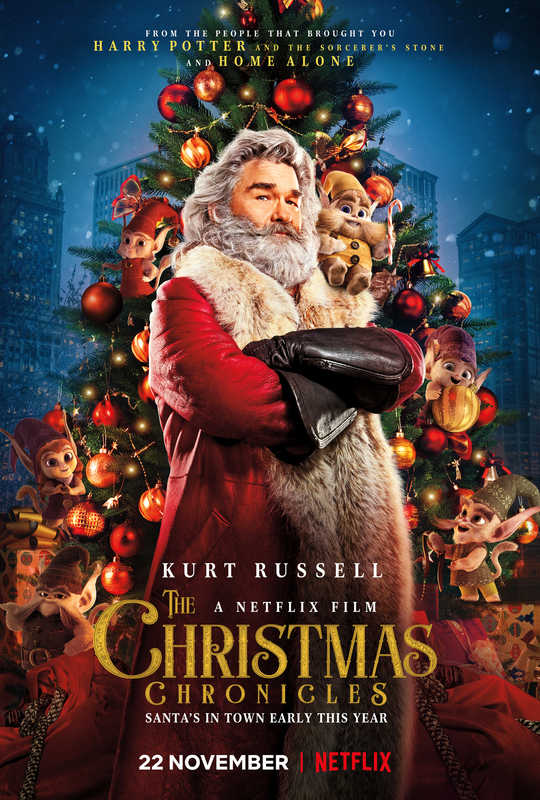 So it’s a small wonder that Netflix loaded its new holiday film The Christmas Chronicles with more bad boy stuff than Santa’s sleigh can hold. Some of the bad boys even get coal for Christmas. Let me backtrack with a word on the story. The Christmas Chronicles has a nice if overly familiar premise of a little girl, Kate (the vibrant and fun-to-watch Darby Camp), who wants to prove the existence of Santa Claus. She also wants to bring together her small dysfunctional family, which has lost its way since Dad, a firefighter, passed away. The bad boy theme starts with big brother Teddy (Judah Lewis). For fun he resorts to stealing cars, and he doesn’t want to babysit Kate on Christmas Eve while Mom works the graveyard shift at the hospital. But Kate “blackmails” him into helping her video Santa when she catches Teddy in the act of a misdeed with her old camcorder. Santa turns out not to be what they expect. Kurt Russell’s Santa is a bit of a bad boy himself. He’s definitely not your run-of-the mill soft-spoken jolly elf. This new take on Santa is pretty funny and refreshing, especially for grownups, but probably too much for younger kids. Santa is even dragged off to jail at one point. Also, I’m not sure why the filmmakers made the choice to animate Santa’s elves in a movie that’s clearly designed for older kids. They remind me of Gremlins–strange and glassy eyed, and not at all cute or sympathetic. That’s not to say The Christmas Chronicles is a bad movie. It’s entertaining enough for a movie night and even has some fun and touching moments. But some of the edgy content, including language here and there, makes it inappropriate for children younger than tweens. This certainly isn’t a PG-13 movie, but if you are like me and trying to shelter your younger child from iffy content, then you are better off with Beethoven’s Christmas Adventure.